There has been a lot of talk about the ALCAR + choline stack. This article will review why you should be supplementing ALCAR and the benefits of adding it to your stack. ALCAR taken by itself may not have noticeable effects on learning and memory but when combined with other nootropics, it may carry a synergistic nootropic effect. ALCAR is simply the acetylated form of l-carnitine. It is considered to be more bioavailable and work differently in the body than l-carnitine. Both ALCAR and l-carnitine are used naturally within the body and are predominantly important in energy metabolism and production. So what is the difference between ALCAR and l-carnitine? Both are used in the energy metabolism process. L-carnitine is essential for the transport of fatty acids into cells for breakdown into energy. ALCAR is created from l-carnitine by the body, and transported in and out of the cells during metabolic processes. In terms of nootropic effects, l-carnitine has little to none while ALCAR is believed to have some benefits. Even though ALCAR has extensive functions in metabolic processes, it also carries other functions within the brain such as assisting in the production of acetylcholine. 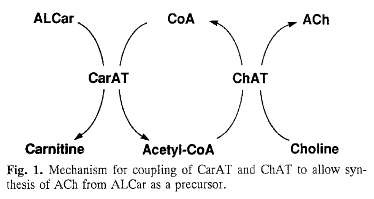 ALCAR breaks down into acetyl COA. Acetyl COA is a molecule within the body that is also important in energy metabolism and production. The important function it has on cognitive functioning is its’ synthesis into acetylcholine. Acetyl COA combines with choline molecules to produce acetylcholine. Therefore, it is believed that combining ALCAR and choline is a synergistic combination and beneficial for acetylcholine synthesis. Combining ALCAR and choline may be a powerful combination. Often stacking choline by itself may not yield higher levels of acetylcholine. There are multiple factors and reasons choline many not be converted. One suggestion is that having limited levels of acetyl COA available in the brain my result in choline not being converted into acetylcholine. So if you are trying to achieve higher levels of acetylcholine in an efficient way, using the ALCAR + choline stack may be beneficial for you. Using both supplements in a stack may give your brain optimal conditions for acetylcholine production. Certain choline sources that are great to stack with ALCAR include: choline salts like choline bitartrate and citrate. Other acetylcholine supplements may or may not be as synergetic. For instance, citicoline, works to free up choline to be synthesized. For that reason, citicoline + ALCAR may be a beneficial combination. Alpha GPC breaks down into acetylcholine via biological process. This means that it may not involve choline directly in the process. This does not necessarily mean that stacking alpha GPC with ALCAR is a bad idea as there are still likely benefits of using them together. For those looking for cost savings, they may not necessarily want to buy a more expensive acetylcholine supplement like citicoline or alpha GPC. While both types of acetylcholine supplements are considered very effective, some people on a budget will stack a cheap choline source like choline bitartrate with ALCAR. Doing this is much cheaper per dosage than using alpha GPC or citicoline alone. ALCAR is not limited to acetylcholine production for its neurological benefits. It is also believed to be a powerful anti-aging supplement by preventing free radicals within the brain. Certain mechanisms of this are unknown but several positive studies have been conducted on ALCAR in this area. One thing for sure is that adding ALCAR to your nootropic stack will not hurt anything. ALCAR may be synergetic and beneficial when stacked with choline. Stacking ALCAR with a cheap choline source or even when used alone, may stimulate higher acetylcholine production within the brain. Higher acetylcholine production when combined with cholinergic nootropics like the racetam family should produce beneficial nootropic results in most people. Regardless of the acetylcholine or choline supplement you are taking, ALCAR should benefit your nootropic stack. It is regarded as an anti-ageing supplement for its potential uses on reducing free radicals within the brain. It is also thought to improve overall acetylcholine levels which should help produce nootropic effects when combined with racetams.